Nearly 1000 minicab drivers protested outside TfL Offices on Blackfriars Road, blocking the road up to Blackfriars Bridge with their cars. 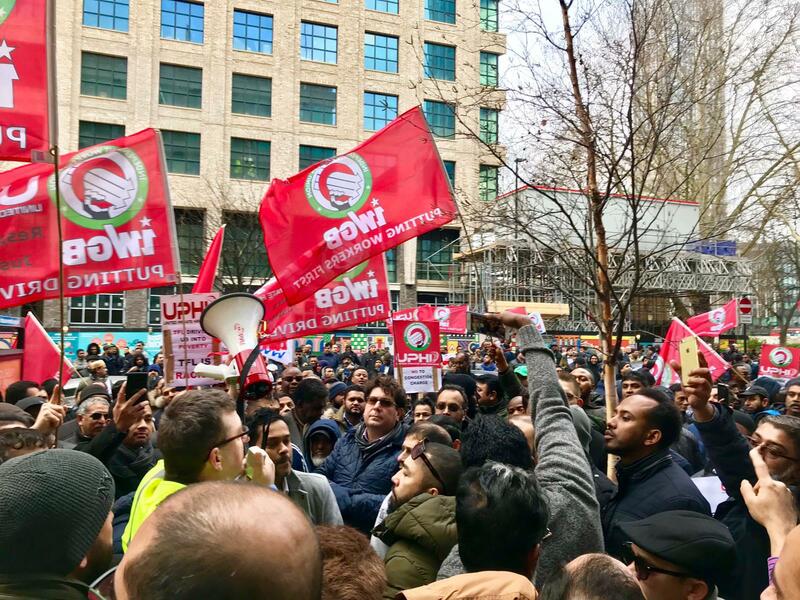 14 January: Almost 1000 minicab drivers converged outside Transport for London's (TfL) headquarters on Blackfriars Road in protest to the announcement last month of regressive congestion charges for minicabs to be introduced in April. The protest, called by the Independent Workers Union of Great Britain's (IWGB) United Private Hire Drivers branch (UPHD) went on today from 10:00 - 12:30, with hundreds of stationary minicabs blocking large part of the Cut, Union Street and Blackfriars Road. Protesters assembled outside TFL’s Palestra House office and marched up to Blackfriars Bridge. The drivers vow to repeat the protest every Monday. Drivers are angry with the policy introduced by the Mayor of London and TfL, which amounts to a “tax on the poor” and will do little to reduce congestion. Drivers chanted, “Sadiq Khan shame on you”, “We want justice” and “Not the drivers, not the poor, tax the operators more”. The charge could see drivers, already on poverty wages, have their take home pay slashed by as much as 25%, according to an analysis by the IWGB's UPHD branch. TfL's own impact analysis showed a disproportionate impact on poor and BME workers with 71% of TfL licensed minicab drivers hailing from designated deprived areas and 94% identifying as BME. Black cabs drivers, which are 80% white British, continue to be exempt from paying congestion charge. A cap on the total number of minicab vehicle licenses. To reduce the amount of time drivers spend on the road waiting for passengers (50% of time drivers spend on the road is without a passenger) TfL should provide dedicated rest spaces for at least 4,000 minicabs to stop in London's zones one and two. The Mayor of London should use his existing powers to enforce worker rights. Minimum wage enforcement would provide the necessary incentive for operators to reduce the number of cars on the road.